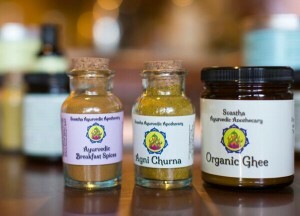 Ask Ayurveda: How can I reduce inflammation in my body? “I am 36 years old, although lately I have been feeling like my age is accelerating at an intense rate. I am the mother of 2 beautiful boys (ages 4 and 6) and work about 30-35 hours a week as a nurse. I have had issues with inflammation in my body since I gave birth to my oldest, 6 years ago. Since then I have had on and off inflammation in all different areas of my body, but the main areas that seem affected have been my knees, my wrists and my stomach. I often feel a sourness in my gut and experience heartburn at least 2 days each week, if not more. I will even get red dots and rashes on my stomach and chest at least once or twice a month. All of these symptoms are at their worst at night, and even more so during menstruation. This pain and inflammation often leaves me fatigued and drained, especially during flare-ups. I am so sorry to hear of these issues you are suffering from. It is tough to deal with for anyone, but especially for a working mom! Although everyone’s story is a bit different, inflammation is a huge issue for so many people this day in age. I am very happy you are investigating a more natural path before jumping on the “prescription wagon” right away. I truly believe that with making the appropriate diet and lifestyle changes you will be able to heal yourself in a natural and healthy way, and feel like your youthful Self again! The symptoms you have described are definitely correlated and are all classic symptoms of a Pitta imbalance. Pitta dosha is related to the fire element in the body and therefore when out of balance will increase heat in the body and mind. This increased heat can lead to many issues, including the inflammation, heartburn and rashes your are experiencing. Many factors can increase the heat (and therefore the Pitta) in the body, but some classical instigators are spicy foods, acidic foods, stress, overworking, hot weather and direct sun exposure to name a few. During menstruation Pitta tends to increase as well, which is most likely why your symptoms worsen during that time. Since inflammation is undoubtably a Pitta imbalance, the main remedies will all be designed to reduce Pitta or heat in the body. Please note that when I say inflammation, I am referring to the red, hot and tender type; rather than swelling that is caused by fluid retention which is more Kapha by nature. The heated inflammation that you have described along with the various other issues you are experiencing need some cooling remedies to calm the Pitta; allowing the essential balance and energy you need in your life as a busy, working mom to manifest. 1. Avoid heat provoking foods. The food choices we make are a huge factor in our health and wellbeing and are often directly related to our health issues. Since inflammation stems from too much heat in the body and blood, it will be vital to avoid heating foods, while favoring foods of a cooling nature. 2. Increase cooling foods in the diet. With all the symptoms stemming from excessive heat in the system, it will be essential to begin to routinely take in more cooling food choices. 3. Perform regular oil massage with Pitta Oil. Abhyanga,the Ayurvedic oil massage, is a routine practice for Self-care and stress reduction. The Pitta Massage Oil is a cooling oil blend of coconut and sunflower oil that has been infused with numerous cooling, anti-inflammatory herbs and essential oils. Take a small amount of Pitta Oil and massage the entire body before bed each night. Make sure to bring some extra attention to the main areas of pain and inflammation as well as the scalp, forehead and feet. ***Just do these areas if time is limited. The oil should be kept on for a minimum of 30 minutes before being rinsed off with water (avoid soap which can be drying and irritating). Alternatively, the oil can be kept on overnight. ***Please use caution and use old clothes and towels after the oil application. If Pitta Oil is not available coconut oil or sunflower oil can be used. Purchase Pitta Massage Oil here. 4. Drink Ginger-Turmeric Tea each day. Ginger and turmeric are highly beneficial for treating inflammation, boost digestion and promoting detoxification in the body. Boil 3 cups of water and reduce the heat to a simmer. Add a 1.5” cube of grated fresh ginger and 1” cube of grated fresh turmeric (can be replaced with 1/2 tsp of dry turmeric). Add a dab of honey once the tea has cooled to a drinkable temperature (never heat honey over 108 degrees). Drink 1-3 cups of this tea blend each day between meals. Alternatively, one can take 1/4 tsp of dry ginger and 1/4 tsp of dry turmeric mixed in 1 Tbsp of aloe vera juice. Take this mid-day and again before bed consistently everyday. 5. Take 1 tsp of Tikta Ghrita each morning. Tikta Ghrita is translated as “bitter ghee” and is the ultimate Ayurvedic medicine for most all Pitta and inflammatory disorders. It is beneficial for cooling the blood, cleansing the liver, healing skin issues such as the rashes and red spots, relieving pain and inflammation, treating arthritis and reducing general Pitta imbalances. This medicated ghee can be take as 1 tsp melted in 1/2 cup of hot water. Take this each morning on an empty stomach and wait 30-60 minutes before eating. Take this consistently for at least 30 days. 6. Reduce overall stress in your daily life. One of the most prevalent causes and provokers of inflammation is stress. Therefore you must allow space for you and your Self-care while you are in this essential process of healing. 7. Take ginger-baking soda baths each week. The ginger-baking soda bath works to not only reduce stress, but is also highly beneficial for pain and inflammation in the body. Add 1/3 cup of ginger powder and 1/3 cup of baking soda to warm bath water and stir thoroughly until fully dissolved. If desired, cooling essential oils such as rose, lavender or lemongrass can be added as well. Take a ginger-baking soda bath at least 1-2 times each week, or as much as needed. Try our Ginger Bath Blend. 8. Take 1 tsp of castor oil, mixed in 1 cup of ginger tea for 10 nights straight. This Ayurvedic remedy is specific for inflammation of the joints, as castor oil is contains powerful anti-inflammatory properties and has a special affinity to the joints. The ginger also is anti-inflammatory by nature, and will acts as a catalyst when used in harmony with other substances. This remedy also works to remove toxins from the joints which is a well-known cause of inflammation and irritation. Directions: Make 1 cup of ginger tea using fresh ginger. Add 1 tsp of organic, food-grade castor oil. Wait until the temperature is drinkable and take this mixture down quickly (this is not a tea you will want to sip on slowly!). Take this each night before bed for 10 nights straight. Do not exceed this time limit, as castor oil is not meant to be taken long-term! 9. Take Mahasudarshana Churna each morning. In terms of herbs for healing Pitta disorders and inflammation, bitter herbs are typically the most powerful and effective. This traditional formula is quite possibly one of the most bitter mixtures Ayurveda has to offer. Mahasudarshana is the classical formula for treating excessive heat, toxins and Pitta imbalance in the system as it contains numerous anti-inflammatory, cooling and detoxifying herbs such as Guduchi, Kutki, Neem, Musta, Turmeric, Daruharidra, Ginger and Ushir (among many others). Directions: Take 1/2 tsp of this formula, steeped in 1/2 cup of warm water (do not strain) each morning on an empty stomach. Take this for up to 30 days consistently, unless directed otherwise by your Ayurvedic practitioner. Purchase our Mahasudarshana Churna here. So Inflammation Mama, here is a powerful list of Ayurvedic remedies to begin your path to healing the inflammation that is invading your body. Through these dietary, lifestyle and herbal treatments, you will begin to notice some major changes in your health as the pain and inflammation subsides, along with the heartburn and rashes. Although the imbalance is strong and fairly chronic at this point, implementing these practices will be enough for observable changes in your health, energy, balance and well-being. In turn for your increased wellness, you will be able to be more present for your growing boys. Therefore, you must take this time to focus on your health in order to be the best mom you can be, for now and years to come! 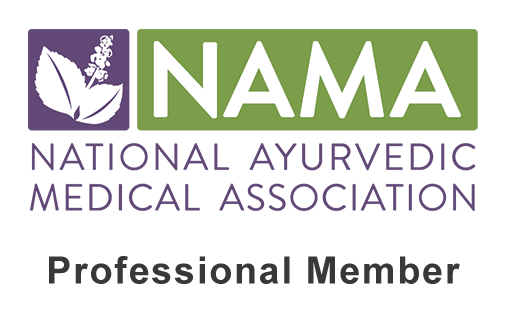 If you need more individualized treatment options, it will be best to see a knowledgeable Ayurvedic Practitioner. In order to give the most effective treatment, it is always beneficial to get a full intake on your current and past healthcare history along with your daily diet and lifestyle routine. In the meantime, this list is a great place to begin! Sending you and your family the love and light you deserve! Are your products organic, gmo free? Thank you. Thank you for your clarification. I appreciate your quick reply.